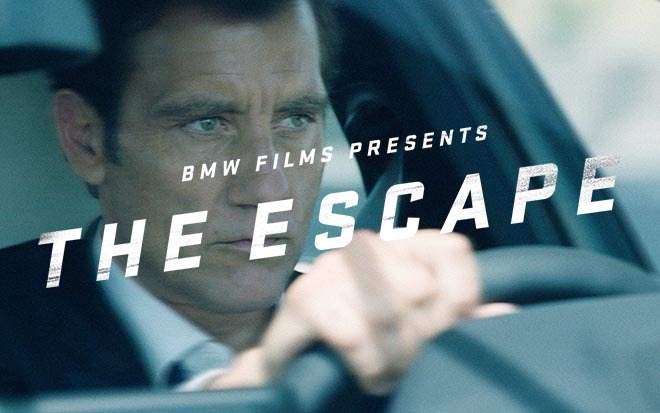 BMW USA has launched “BMW The Escape”, a new short film featuring Clive Owen, 15 years since the launch of The Hire. The original series of short films, released over two seasons from 2001 to 2002, starred Clive Owen as a mysterious driver hired to compete various missions. 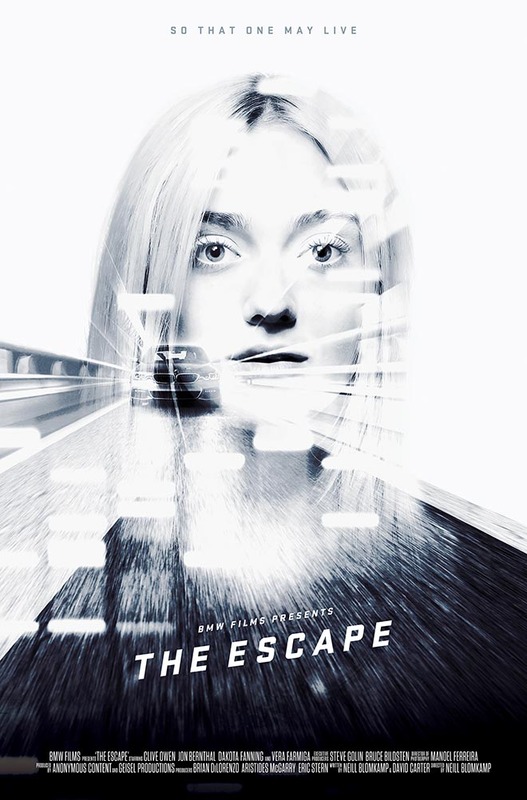 Clive appears again as the Driver in The Escape alongside Dakota Fanning, Jon Bernthal and Vera Farmiga in a film directed by Neill Blomkamp. The all-new BMW 5 Series sedan serves as Owen’s vehicle of choice and co-star. 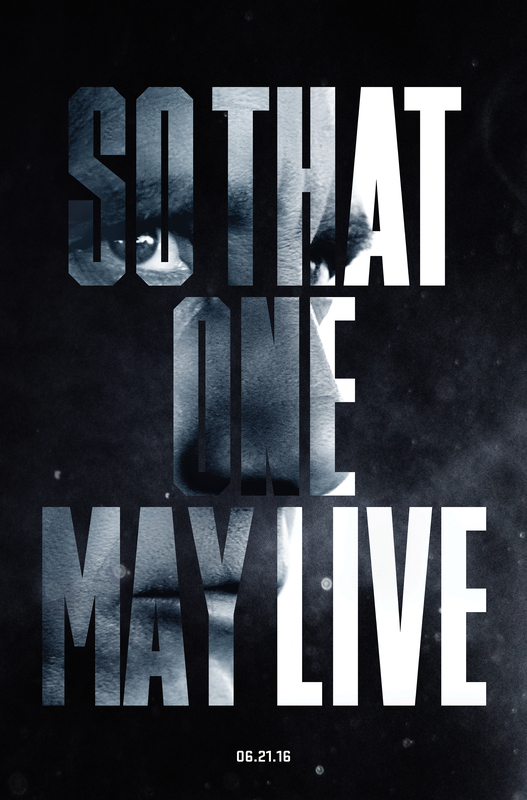 BMW has launched the series online at bmwfilms.com, with trailers, posters and behind-the-scenes footage and photography. After the controversial disappearance of their Chief Medical Officer, a shadowy bio genetics company, MolGen (Molecular Genetics) is under siege by the FBI for secretly cloning humans. Amidst the chaos, Molgen’s head mercenary Holt (Jon Bernthal) is sneaking out the last living clone, Specimen Number 5, a young woman named Lily (Dakota Fanning) to a mysterious buyer. Holt has hired The Driver (Clive Owen), accompanied by a heavily armed squadron of fellow Molgen mercenaries, to evade the authorities and deliver Lily and himself to the buyer. The journey takes an unexpected turn and Holt is forced to take matters into his own hands, as the driver once again demonstrates his mettle and extraordinary driving skills. 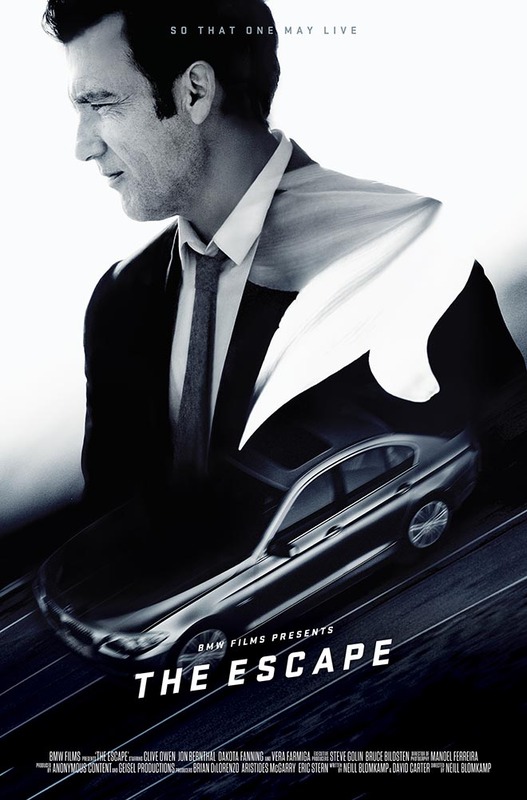 With “The Escape,” Blomkamp joins the A-list stable of original BMW Films directors from the seminal project including Academy Award® winners Alejandro G. Iñárritu and Ang Lee; Joe Carnahan, Wong Kar-wai, Guy Ritchie, John Woo and the late John Frankenheimer and Tony Scott. “The Hire” also featured A-list talent in front of the camera including: Gary Oldman, Stellan Skarsgård, Forest Whitaker, Mickey Rourke, James Brown, Don Cheadle, Madonna, Adriana Lima, Danny Trejo, Kathryn Morris, Marilyn Manson, Ray Liotta, Robert Patrick and Dennis Haysbert. “The Hire” was released exclusively online at BMWFilms.com and received more than 100MM views prior to the proliferation of high-speed internet connectivity and introduction of YouTube. The BMW The Escape campaign was developed at Geisel Productions by creative directors/copywriters Bruce Bildsten and David Carter, executive producer Brian DiLorenzo, senior integrated producer Adam Davis, producer Patrick O’Brien. Filming was shot by director Neill Blomkamp via Anonymous Content with executive producers Eric Stern and SueEllen Clair, head of production Kerry Haynie, producer Aristides McGarry, action supervisor/2nd Unit director Guy Norris, director of photography Manoel Ferreira, production designer Gerald Sullivan, production manager Sara D’Alessio, production coordinator Jennifer Duffy. Editors were Austyn Daines, Julian Clarke and Devin Maurer at Rock Paper Scissors with supervising editor Angus Wall, cutting assistant Martin Hsieh, executive producers Helena Lee and Jennifer Sofio Hall, producer Dina Ciccotello. Music is by Kristopher Pooley. 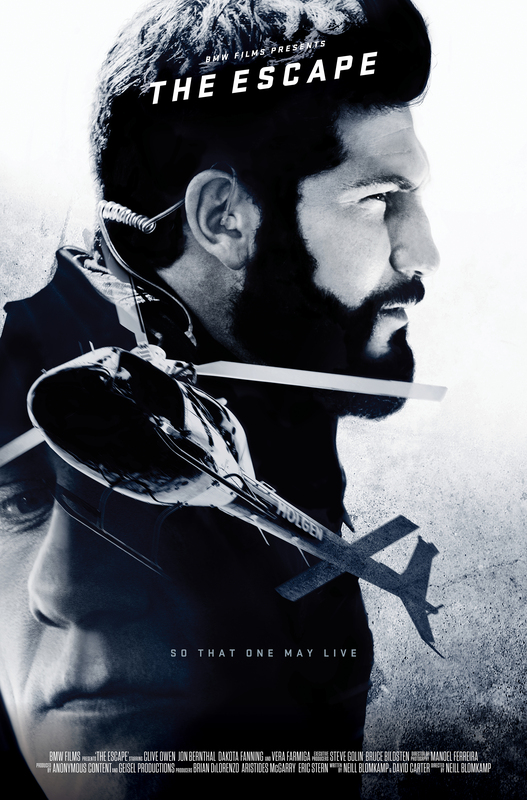 Finishing and visual effects were produced at The Embassy VFX and A52 by Flame artist Dan Ellis, executive producer Patrick Nugget, head of production Kim Christensen, post producer Victoria Burkhart, post producer Heather Johann, VFX supervisor Chris Harvey. Color was produced at Company 3 by colourist Stefan Sonnenfeld and executive producer Rhubie Jovanov. Sound was mixed at Formosa Group by audio engineer Mark Mangini. Sound was designed by David Whitehead. Behind the Scenes was directed by Patrick Pierson with producer Beth Wilson at Drive Thru Editorial. Titles, poster and art direction were produced at Design by MING by chief design officer Brad Blondes, lead designer David Balsamello, designer Olga Vladova, and junior designer Sarah Maslechko. The website was developed at Your Majesty by technical director Tore Holmberg, lead developer Sebastian Carlsson, design director Alexander Strand Kristensen, senior producer Jason Speenburgh, engagement director Ashley Smith. Social media was handled at 247 Laundry Service by account manager Matthew Carlson, community manager Samantha Pillsbury, narrative director Jocelyn Chang, post production supervisor Chris Lewis, and editor Mike Mazzotta.